The first time I visited GREER Chicago was magical. It’s one of my favorite stores anywhere, owned by one of my favorite people anywhere. I was lucky enough to go back last weekend. GREER is on a busy corner on North Wells Street in Old Town, one of the most vibrant and interesting parts of Chicago. If you’re there, you must go. GREER is owned by Chandra Greer, who’s made it her personal quest to take civility seriously. 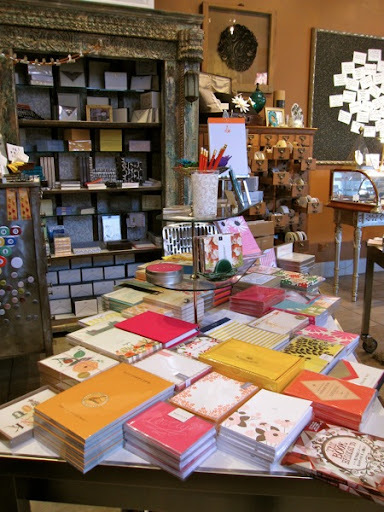 Stationery is her avenue, and her store offers buyers endless ways to communicate with paper. She provides the tools: paper, cards, pens, stamps, envelopes, posters, books and calendars are just the beginning. On this visit, I took special note of Chandra’s great attention to detail throughout her beautiful store. Beauty is everywhere, via words and objects. A stack of Civilettes, Chandra’s personal creation — a missive that can be tucked into gifts and cards, and reused. The small cards say thank you, good job, I’m sorry or I love you. More on the Civilettes and Chandra’s story. Floral designs, some made from fabric, cozily tucked onto a shelf. Here’s what I mean about the attention to detail. The thoughtful vignettes get the ideas going in your own mind as you browse. 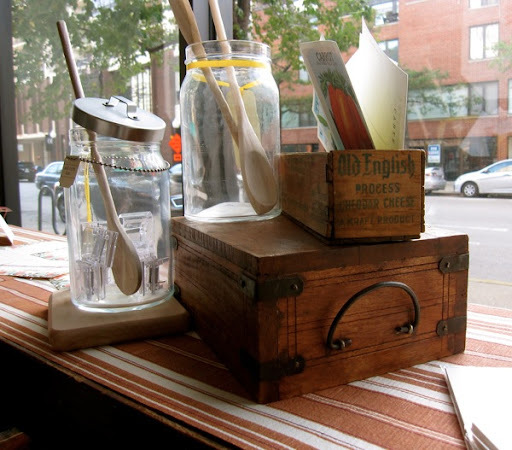 The use of vintage pieces and antiques lovingly enhance the wares on display. Is it a card you need? You’ll find the perfect one here. You’ll find several perfect ones here. Chandra’s known for her support of indie designers, and you’ll see things here you won’t find elsewhere. A classic, one of my personal favorites. A peek inside an antique display case at the beautiful writing instruments. A selection of beautifully wrapped gift soaps is tempting as a treat for yourself. I mean, who does this? Flawless and witty attention to detail. Ready for Halloween. GREER is a must-do destination for celebrating any occasion or event. The ever-changing window displays delight the lucky neighbors who pass by regularly. The selection of ribbon for packages or projects is another reflection of Chandra’s excellent eye for beauty. Humor and inspiration abound on the recycled rubber bulletin board via handwritten quotes. Mariesa and Wendy, two of the adorable and awesomely helpful GREER girls. They both made my visit so fun as we chatted about jewelry, journals, big life changes and what not. If you can’t make it to the store, the website is equally stunning. A custom poster design by Hammerpress with the store’s motto will greet you there. Delicious copywriting too! Thanks again for making my visit so special, Ms. Greer! This entry was posted in Chicago, Civilettes, GREER, New Category, stationery by Kitty Sheehan. Bookmark the permalink. I absolutely ADORE this post! I have not been lucky enough to visit Greer, but am very lucky that she supports indie designers like myself. I love being able to see the inside of such a fabulous store. Chandra's warm personality is clearly evidenced by her attention to detail as seen in your photos. Thanks for bringing Greer to those of us who can't quite make it there! Thank you so much, Claudia. It was fun to see YOUR work there in person too. I feel like the 7 hour drive to Chicago from Minneapolis would be worth it just for this place. LOVE IT! Ashley, yes! Go. You'd love this store and Chandra. And so much music and food and fun in Chicago. Spent much quality time wandering the store with Wendy last time I was in town. That would've been a fun meeting for eavesdroppers! I was blown away by your previous post about GREER but this one literally has me reading and thinking “Where the hell is this place because it's FABULOUS?” Thank you for chronicling our little world in such an intelligently described and exquisitely photographed way. This is as much a testament to YOUR talent as it is to anything we do. And somehow Wendy has maintained her innocence. Thank you Ms. Channy. It was a labor of LOVE. I love this post! I visited GREER lovely store a while back, and was so excited at the time to discover it had opened, in my old neighborhood of Old Town. Your photo's let me reminisce of the store's charm and unique merchandising. My heart skip a beat when, the photo labeled pencils showed my old home (the red brick one). I can't wait to share this post with some friends that will love this post and discovering GREER with all the celebrations upon us. I'm twitter friendly with Chandra and hope to meet her in person some day. Even more serendipity, is my last name was the same as yours. What a gorgeous shop Kitty! Thank you so much for the gracious comments, Canace, Paper Toss and Noir Blanc! Canace, we'll see if we can arrange this! Paper Toss, thanks so much for the share on Facebook. Noir, small world! See you on Twitter! what a marvelous post – a tribute really. I am determined to one day see this amazing store.